Hellboy began in August of 1993 through Dark Horse comics, and was eventually rendered to film in 2004 (written and directed by Guillermo Del Toro). The character became a cult hit, and produced a film sequel, animated films and video game appearances. The appeal of course is that he’s spawned from one of Satan’s minions, has an amazingly bizarre look, is a drunken rebel and spouts one liners straight out of the Bruce Willis school. He basically is what every post collegiate boy wants to be. This particular film – written by Andrew Cosby and directed by Neil Marshall – does a good job of bringing him back, covered in a too-dense story that goes exactly where it was expected to go, but does bring in some spicy mythology and underground conspiracy … just another day of hell on earth. The film opens with Hellboy (David Harbour) searching for a fellow paranormal investigator in Tijuana, Mexico. It turns out he has been “demonized” as a Lucha libre masked wrestler, and after a confrontation he warns Hellboy that the end of the world is coming. After a proper drunken bender, the demon is collected and brought back to his father, Bruttenholm (Ian McShane), who also runs the organization that Hellboy works for, the Bureau for Paranormal Research and Defense (BPRD). Hellboy is assigned a new case, which involves a Blood Queen (Milla Jovovich) and giants in Britain. The queen is an ancient sorceress who was defeated by King Arthur, but has reemerged, and the giants are part of the comeback. Hellboy is sent to a secret society in Britain for battle, and within that network meets Alice (Sasha Lane), an ally who can communicate with the dead, and Ben (Daniel Dae Kim), a BRPD agent who can turn into a cobra. It is this unlikely team that will battle the Blood Queen. Yep, it’s a pretty dense story, with Hellboy’s origin shoehorned in for good measure. It’s difficult these days, with the demands put upon high budget superhero (or in this case, anti-hero) films, to simplify the introductory stories. 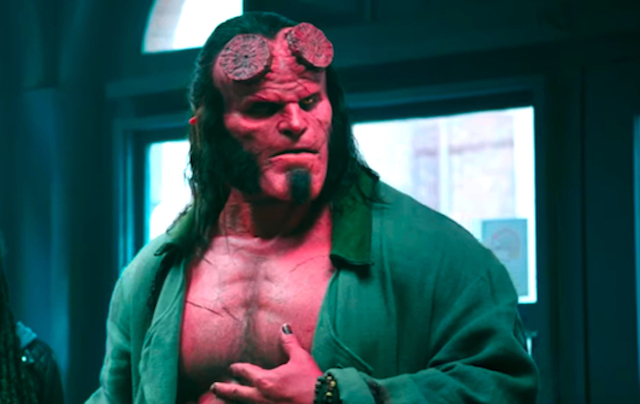 It seems to be a requirement to have some sort of origin, even for already introduced characters like Hellboy – but to the film’s credit, it didn’t start with the origin – and when you put the villainous confrontations within all that, it can get hard to follow. “Hellboy” the movie barely hangs on, but there is definitely too many elements in the plot. However, the beauty of Hellboy is that the character itself overcomes the overwrought plot. He kind of floats above it all, and David Harbour’s interpretation – which he characterizes as “younger” than Ron Perlman’s H’boy – is terrifically expressive and down to earth. Are there any folks in their twenties or early thirties who don’t feel like they’re outside the system? That’s how I would qualify Hellboy, an outsider who has to capitulate to the inside, thus he becomes relatable on many levels. I don’t know if the film needed the Blood Queen story. I mean it’s pretty interesting (her body parts are kept separate so she can’t emerge), but it needed more focus in the midst of battling giants and figuring out who Hellboy is. The density of the story keeps fighting its plot elements, so nothing gets any real juice. 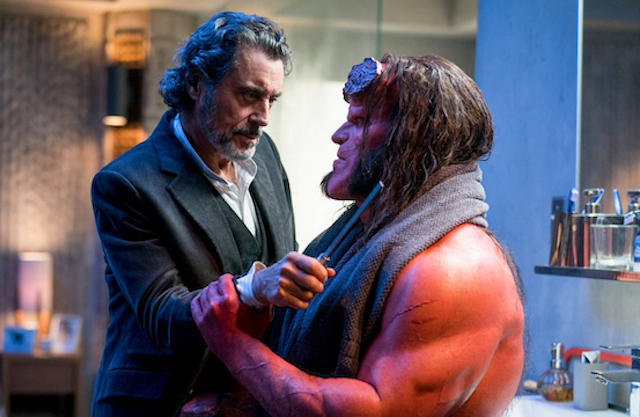 Ian McShane, one of the more intense actors working, is almost a walk-on as Hellboy’s adoptive father, and it would have been more savory to get his take on more of the action. As noted, overstuffing continues to be a problem with the first film of superhero franchises. The film has a sensational rock and roll soundtrack, without clichés (how in the name of Lucifer did the filmmakers resist the urge to use Van Halen’s “Running with the Devil”?). Hellboy is a demon character for the ages, positioned perfectly between our taste and distaste regarding the concept of hell. Like the fear of Satan, long may he reign.